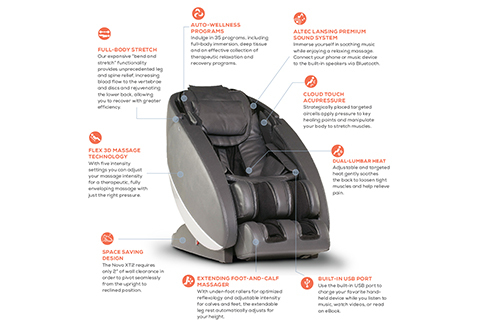 The Human Touch® Novo XT2 Massage Chair features a striking appearance and best-in-class performance, with a Unibody design that enhances any room. 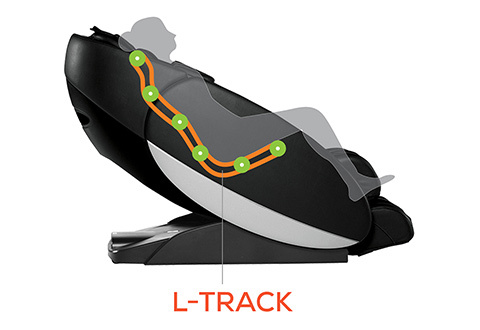 The L-Track massage system extends high performance coverage from your neck to your glutes while the S-Track delivers a 3-D massage down the curvature of the spine. 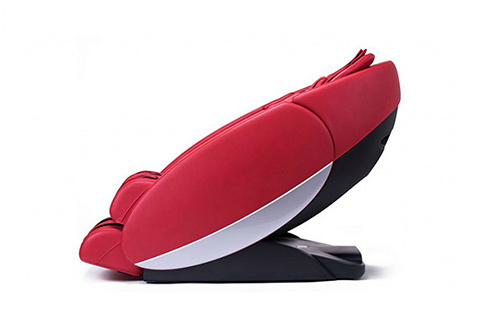 Also features adjustable dual lumbar heat and a built-in speaker to play soothing sounds. 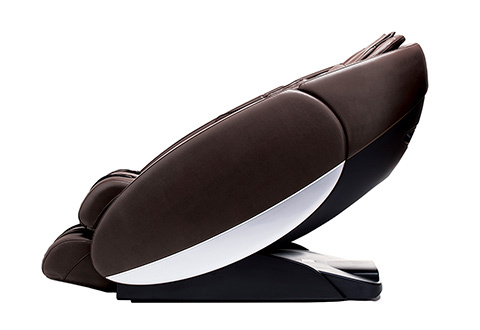 Available in Black, Red, Gray, Cream or Espresso. Wall clearance 2”. 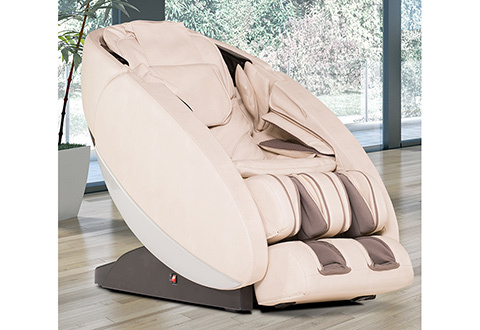 Max weight capacity 285 lbs. Max height 6’9”. Optional White Glove delivery service available. 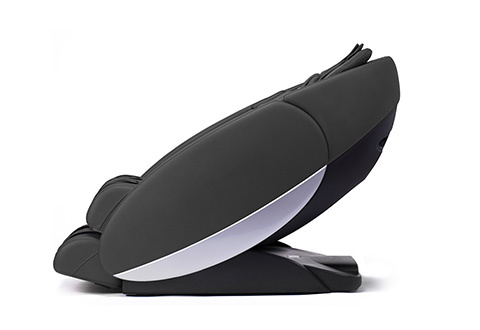 Item Will Ship in Approximately 2 Weeks	Free Shipping and Free returns! Risk-Free trial for 30 days. 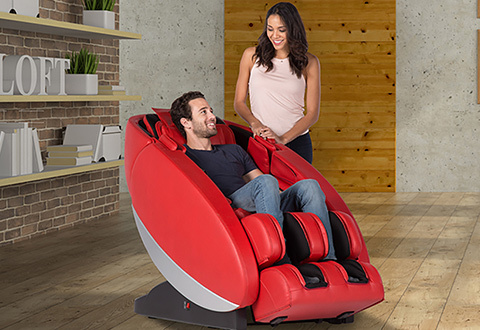 Use promo code MCHAIRFS at checkout.Click here for Details. 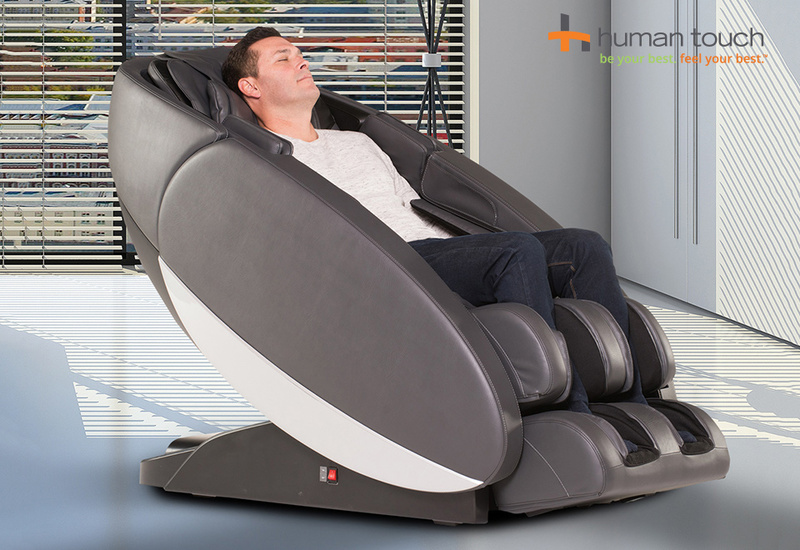 The Human Touch® Novo XT2 Massage Chair helps you prepare for, and recover from, strenuous workouts and work days. 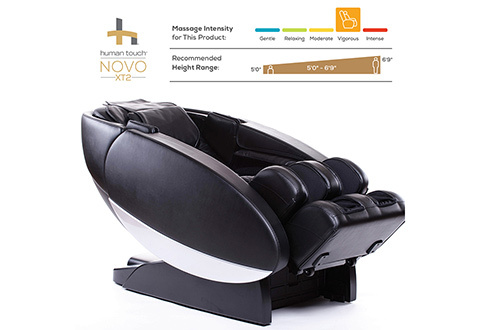 By increasing oxygen-rich blood to tired, sore muscles, Novo XT helps to restore the body's natural well being. 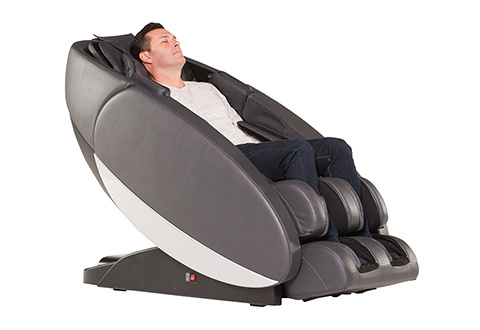 Indulge in 35 auto wellness programs, including full-body immersion, deep tissue and an effective collection of therapeutic relaxation and recovery programs. 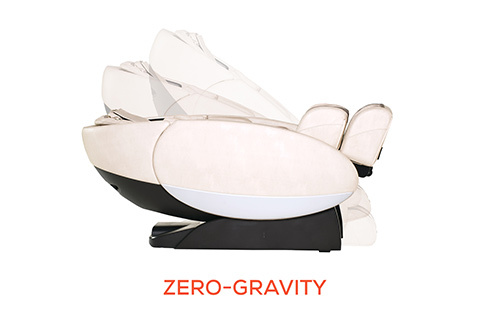 Ergonomic zero-gravity seating provides extra relief of back pain and reduced pressure on the vertebrae, allowing your large muscles to completely relax for a restorative massage. 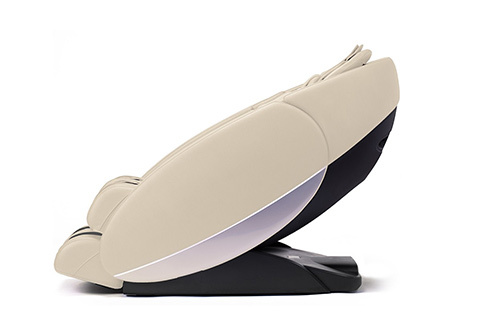 • Flex 3-D Massage Technology — expertly mimicking the hands of a world-class masseuse, Novo XT massage technology extends into muscles for a therapeutic, fully enveloping, intense massage. 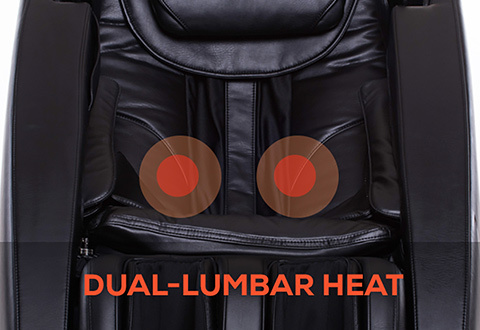 With five intensity settings, you can customize just the right massage pressure to your liking. 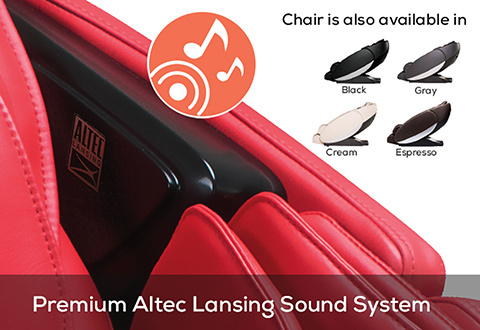 • Maximum weight capacity: 285 lbs. 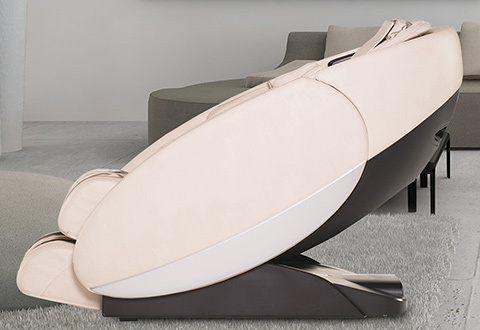 • White Glove Delivery option: Our two-man team will deliver item to the room of choice, unpack item and do light assembly. They will remove all trash and debris when finished. This delivery includes up to two flights of stairs. 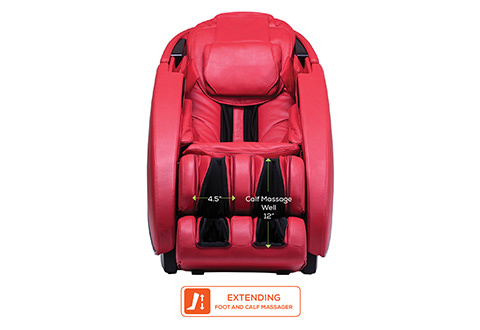 • Please Note: Massage Chairs cannot be shipped to Alaska or Hawaii. FREE Shipping! 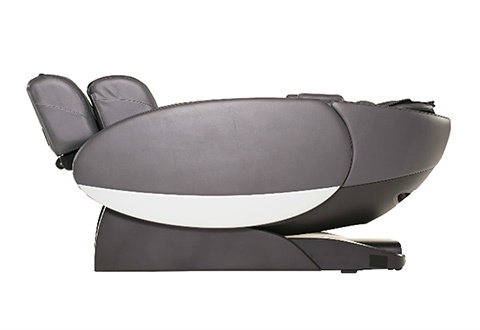 Plus, 30-Day Risk-Free Trial on this Massage Chair! 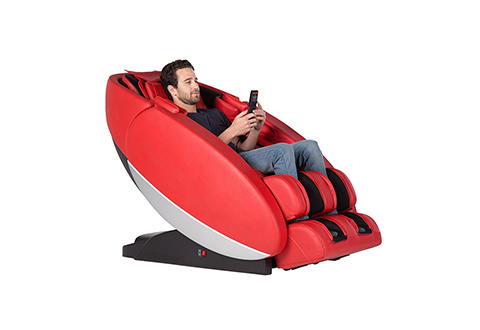 If you are not satisfied with this Massage Chair purchase within 30 days of receipt, please contact Sharper Image Customer Support at 1-800-721-0644 for return authorization. Sharper Image will arrange for your unit to be picked up, and your original purchase will be refunded. 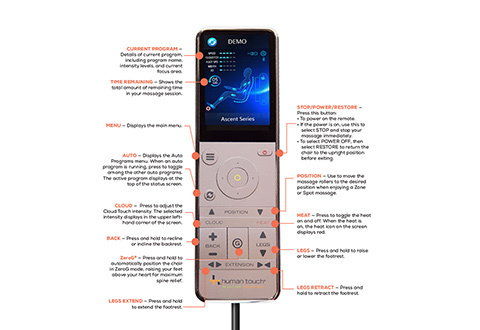 You must contact customer service within 30 days of delivery. Please keep all of your original packaging material to be used for your return to be eligible for your Risk Free promotion.